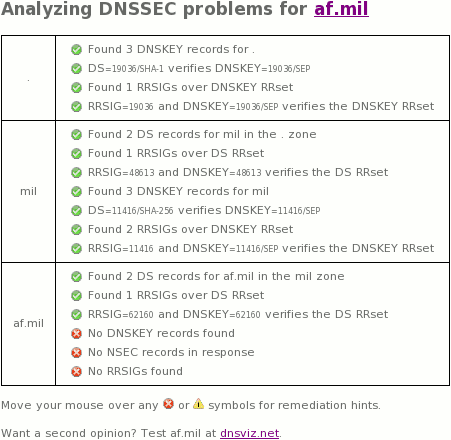 This page gives some details on the af.mil DNSSEC outage on June 24, 2015. The outage was fixed by removing DNSSEC support (unsigning). OpenDNS does not support DNSSEC, instead supporting DNSCurve. Google Public DNS currently supports only DNSSEC, and thus, Google's users saw SERVFAIL for queries under af.mil during this outage. ; <<>> DiG 9.4.2-P2 <<>> www.af.mil. @resolver1.opendns.com. www.af.mil. 52 IN CNAME www.af.mil.edgesuite.net. www.af.mil.edgesuite.net. 52 IN CNAME a499.dscb.akamai.net. 2015-06-24 14:51:42 — "DS found at parent, but no DNSKEY found at child." 2015-06-24 15:17:16 — "DS found at parent, but no DNSKEY found at child." 2015-06-24 15:47:09 — "DS found at parent, but no DNSKEY found at child." Zonemaster (also run by iis.se) was also having trouble, but finally decided to archive this af.mil DNSSEC outage.